St. Thomas, US Virgin Islands. The Caribbean lived up to its reputation as one of the best places on the planet to sail during the first day of racing in the 45th St. Thomas International Regatta (STIR). The nearly fifty boats, competing in four classes, reveled in the perfect conditions: 10- to 15-knots of breeze, 3- to 5-foot swells, blue sunny skies and temperatures comfortably in the 80s. With the weather throwing no curve balls, the big focus of the day for the racers was on each other. This proved formidable given the depth of talent in each class. The Spinnaker 1 class is extremely competitive with only four points separating the first through fifth places. In fact, both second and third place boats, Puerto Rico’s Luis Juarbe’s Melges 32, Soca and the USA’s Robin Team’s chartered J/122, Teamwork/El Ocaso, respectively are tied on points. 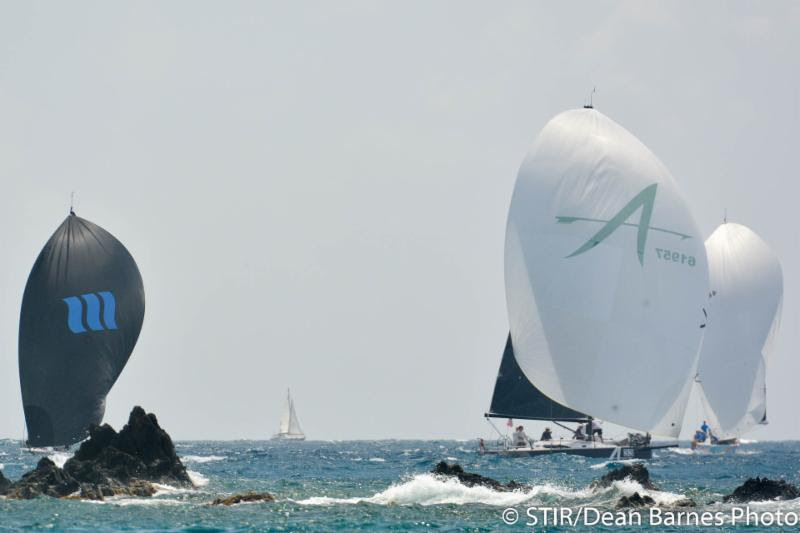 Ditto for the boats in fourth and fifth place, Antigua’s Bernie Evan-Wong’s RP 37, Team TAZ, and St. Thomas’ Peter Corr’s King 40, Blitz. Blitz won this class in 2017 and Corr hopes to do the same again this year. In the Spinnaker 2 class, Puerto Rico’s David Fernandez, and his team aboard his Holland 11-meter, Atorrante, didn’t take the lead. That honor belonged to Canada’s Rob Butler’s crew aboard his new Reflex 38, Touch2Play Racing. However, what the Puerto Rico-based team aboard the Holland 11 meter had was a solid third place and great fun. “We had good wind and great competition. Touch2Play and Boogaloo (St. Croix’s Peter Stanton’s Melges 24) were the boats we saw most on the course. In fact, in the first race, we were neck and neck with Touch2Play around Buck and Capella islands. We were higher and faster and traded tacks for a while. Eventually, Touch2Play got away from us,” says Greg Fink, who trimmed spinnaker. Three of Atorrante crew were 16-year-olds who just graduated from the Optimist dinghy: David Perez Fernandez, Kyle Fink and Fabio Santiago. There was equally close racing in the CSA Non-Spinnaker class between leader, St. Thomas’ Lawrence Aqui driving his Dufour 40, Wild Thing, and second place Hermes, a Pogo 12.5 sailed by Ontario Canada’s Irek Zubko. “At one point, it was almost like we were match racing,” says Zubko.